For two years, an iron fist ensured that the party remain over in San Luis Obispo at no small cost. 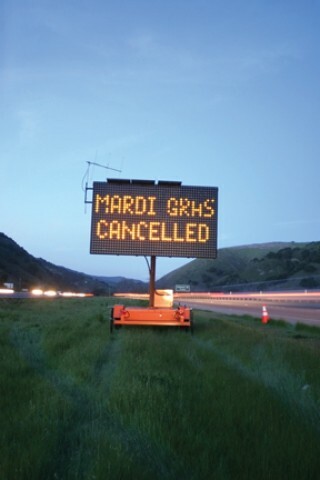 SIGNS OF THE PAST : Crackdowns in recent years put an end to the massive revelries of historic Mardi Gras celebrations in San Luis Obispo. City officials now believe that the memory of parties past has dimmed in local minds. # In the wake of a 2004 holiday melee, the city traded its typical Mardi Gras decor for hundreds of overtime-collecting riot police, countless DUI checkpoints, and a downtown incident command center. An extensive public relations campaign punctuated city officials' grave stance on the issue. The resulting bill topped a cool $1 million in the first year alone. This year, however, San Luis Obispo decided to give up its preventative police force for Lent. The city ordinances passed in December of 2004 are still on the books, but without the massive garrison of years past, what's to prevent Mardi Gras revelry from rebirth? Through extensive conversations with police and leaders of the student community, city leaders feel confident that the shades of the party are too faint to cause any trouble. "The institutional memory of the event has become less," council member Christine Mulholland said. "There are a lot of students saying 'What Mardi Gras?'" Considering how long kids spend in college these days, can this really be so? New Times fanned out on two weekend nights in search of an answer by quizzing 131 students on the topic of the hour. We compiled the responses to determine how much Cuesta and Poly students remember or know about the party, the riot, and the aftermath. What year did the riot occur? 75 percent were upperclassmen. Surprised? What sparked the actual incident? The installation of two correct answers was no accident we wanted to gauge student spin on what caused the 2004 riot. All accounts begin with police busting a massive series of parties at student housing complexes around Foothill Boulevard. With thousands of intoxicated partygoers then flowing into a two-lane street around a solid cluster of riot police, witnesses recalled that it seemed only a matter of time before this perilous avocado turned sour. SLOPD claimed that the situation escalated when some revelers launched an aerial assault against the officers, which they answered with a volley of non-lethal munitions. Numerous students complained after the riot that the violence only occurred because officers busted the Foothill parties without a clear idea of how to manage the crowd afterward. Only 9 percent of Mustangs and Cougars went for our decoys. A group of college women from Minnesota flashing a crowd started the larger Halloween riot in Madison, Wis. earlier that academic year. In April of 2006, a tussle between Bakos and Poly locals brought a tumultuous end to San Luis' late-night SafeRide program. Which of the following did not result from the Mardi Gras riot? The San Luis Obispo City Council voted City Ordinance 9.22 a law tripling party foul penalties during Mardi Gras season into effect on Dec. 14, 2004. The proposed ordinance was originally only to affect downtown and the neighborhood around Foothill, but several student groups decried a bias. The adopted version set the Safety Enhancement Zone as everything within city limits. San Luis Obispo spent nearly $1 million in 2005 assembling a massive occupation force to prevent another street bash from materializing. Finally, to the astonishment of many of our test subjects, GOP lawmaker Abel Maldonado did in fact push legislation to require additional punitive action against students charged with a "riot crime." The drafted bill carried some constitutional baggage, however, as some of its wording could have potentially triggered the ejection of non-violent protestors as well. Juniors and seniors comprised 81 percent of the group of test-takers able to recall, in short answer format, the non-incident known as Polygras. A few months before Mardi Gras 2005, a few Poly students attempted to reschedule the threatened street party as an underground event on a hush-hush date. The idea was to shake the fuzz and those pesky fines, but the plot ran afoul when the San Luis City Council rewrote the then-proposed Mardi Gras ordinance to mandate the fine hike for not only Fat Tuesday but the weeks prior to and after it. None of the would-be organizers actually followed through on throwing the much-hyped bash. The post-riot cleanup cost the city how much? City officials disclosed after the riot that clean-up costs totaled approximately $500,000. True or false there will be an elevated police presence again this year. As SLOPD's Capt. Dan Blanke commented on this year's scaled-back effort, "It's basically come full circle." Expect a police force more closely resembling pre-riot years though most students who took our survey sure didn't. If the police arrived at a student's house for a noise complaint on Mardi Gras, discovered a party with underage drinking, and found the tenant taking a whiz in the street, what (roughly) would the fine total come to if they were all first offenses? We accepted answers within $200 of the correct amount. Still, a stunning number of students demonstrated the uncanny ability to calculate or guess the monetary penalties for these three common campus offenses. A substantial number of undergrads nailed the non-Mardi Gras fine total for such a situation (around $300), however the vast bulk of the field overestimated the fiscal repercussions of this little theoretical exercise. What was the historical vibe of the Mardi Gras party? Granted, it's a fairly subjective question, but the staff report behind the adoption of City Ordinance 9.22 indicated a rising curve of citations in the decade leading up to the final party. Staff Writer Patrick M. Klemz went 2-1 in the Beirut drinking game while collecting data for this experiment. To issue him a challenge, e-mail pklemz@newtimesslo.com.